is neutralized by magenta from manganese. … you must always use manganese of Piedmont the way it is made for Murano, because the manganese of Tuscany and Liguria has more rust, which always make the melt dark. This color correction technique was known as early as the late 14th century and by Neri’s time it was a widely practiced technique in the glassmaker’s toolbox. Manganese oxide was known as a pigment in antiquity; the Magnesia region in Thessaly, central Greece was an ancient source for the black mineral. Around the year 1450, a clear crystal-like glass suitable for working into thin elaborate forms was developed in Venice. 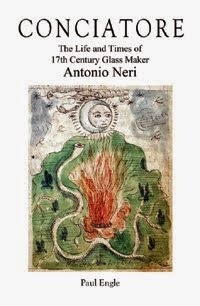 The glass was called cristallo and Murano glassmaker Angelo Barovier is often given credit. He may well be responsible for bringing together several existing techniques—manganese color correction among them — but these techniques individually were all available and utilized by glassmakers at least fifty years earlier. Barovier’s innovation would become a tradition giving Murano the reputation for the finest glass made anywhere, carried on by countless glassmakers and ultimately by our Florentine priest more than a century and a half later. Removing the green tint of iron contamination with manganese is a clever trick. The manganese imparts a magenta tint to glass. As the complementary color to green, it effectively "cancels out" the green tint. The trade-off is that the glass is slightly darkened, even if appearing as a neutral color to the eye. When light passes through glass tinted by iron, green light is unaffected, which is why it appears green. The other colors that make up white light, notably red and violet are dampened. In effect, the green is enhanced. Now, adding manganese to the glass dampens only green light and brings the spectrum back into closer balance. The overall effect is that all the colors of light are slightly dampened, but by the same amount. In Neri's case, minor contamination from iron would produce only a small green tinge and the problem was corrected with a small dose of manganese. The resulting grey would hardly be noticed, especially in the thin, delicate pieces so popular at the time. To the eye of all but the most experienced expert, this decolorized glass had perfect crystal clarity. 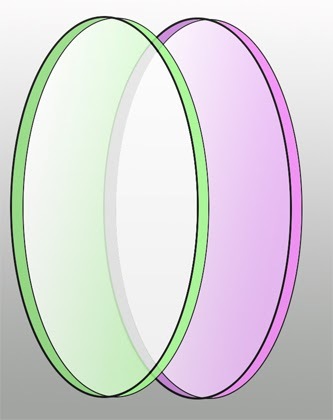 Decolorization of glass is an example of a technique that was developed through experimentation without a deep understanding of the physics involved. Theories of light and color and the way they are perceived by the human eye came much later. In fact, manganese itself was not isolated as a metal until 1774, yet it was used skillfully by glass artisans three or four hundred years earlier. This post first appeared here in a slightly shorter form as 'Manganese of Piedmont' on 14 October 2013.